After saying goodbye to her loving family, a hard-working mother cat heads to her job at a construction site. Cats in hard hats make work seem like play in this cheery, rhyming picture book about building something and having a loving family to share your accomplishments with. Construction cat wakes up at dawn, grabs her boots and tugs them on... It's time to build! Tail high, Construction Cat kisses her family goodbye and goes to work with the other cats on a construction site. They lug lumber and pound nails, they saw, sand, and sweep the dust, all to build a truly paw-some park that they can't wait to share with friends and family! Sydney Hanson's lively and lovable cats combined with Barbara Odanaka's rhythmic story create a universal story that is a joy to read again and again. Barbara Odanaka is a former Los Angeles Times reporter who left daily journalism to backpack around the world and write children's books. She is the author of Construction Cat, as well as Smash! Mash! Crash! There Goes the Trash and A Crazy Day at the Critter Cafe. Her polydactyl cat, Mittens, is much too lazy to work heavy machinery. Please visit Ms. Odanaka at BarbaraOdanaka.com. 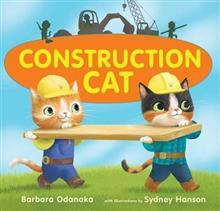 Sydney Hanson is the illustrator of Construction Cat. She was raised in Minnesota alongside numerous pets and brothers. When she wasn't tunneling through snowdrifts or rescuing frogs from rain gutters, she was drawing. Her illustrations and paintings still reflect these early adventures and are marked by a love for animals and the natural world. She lives in Los Angeles where she's worked for several animation shops. In her spare time she enjoys traveling and spending time outside with her adopted brother, a Labrador retriever named Cash.